Leprosy has a wide spectrum of clinical presentations involving primarily the skin and nervous system. 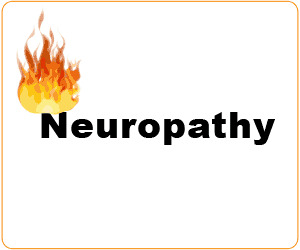 Due to involvement of peripheral nerves, which can become enlarged and palpable, cutaneous lesions of leprosy exhibit hypesthesia or anesthesia. 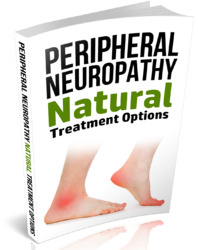 Some peripheral nerves are more commonly affected, partly due to their superficial location. Branches of the facial nerve, the ulnar and radial nerves, the common peroneal nerve, and the posterior tibial nerve are commonly involved. Decreased sensation to pain and temperature and neurotrophic changes can also be noted on exam. Historically, leprosy was divided into four types: lepromatous, which occurs in patients with depressed cell-mediated immunity; tuberculoid, occurring in patients with intact cell-mediated immunity; dimorphous; and indeterminate. The more recent and commonly accepted classification of leprosy is also based on polar forms and similarly reflects the underlying host immunity as measured by the T-lymphocyte and antibody responses to M. leprae, with lepromatous leprosy at one end, tuberculoid leprosy at the other end, and three types of borderline leprosy in-between. 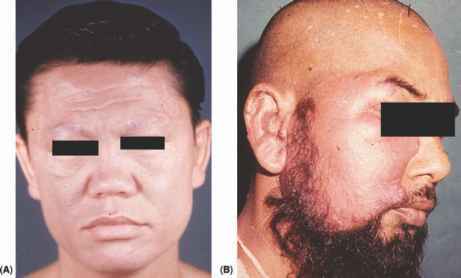 Borderline leprosy is characterized by more asymmetric lesions that range in severity depending on which pole (lepromatous or tuberculoid) the patient is closer to. Tuberculoid leprosy can present with only few skin lesions characterized by erythematous to hypopigmented plaques with raised borders, associated anesthesia, hypesthesia, alopecia, and unilateral trophic changes. FIGURE 8 Diffuse infiltration of the face presenting as confluent indurated plaques on the face leading to madarosis in a patient with Hansen's disease (A). Reversal reaction in a patient undergoing treatment for Hansen's disease (B).